On Monday April 19th, DC residents seeking a vote in Congress were on the verge of achieving what they had worked for over 50 years to accomplish. Both houses of Congress were willing to grant DC a voting seat in Congress. The catch? In order to get the voting seat, they had to accept an easing of DC’s draconian gun laws. That’s right … in order to get one right that they felt strongly about, all they had to do was accept other rights for the residents of DC. The strength of gun forces in the Congress has grown, not diminished, over the year since we began working. … It is now clear that the gun amendment can be passed as a standalone bill or attached to another piece of legislation, and we see no better opportunity in sight for voting rights for our residents. The Democratic majorities in the Senate and in the House are already diminishing and are expected to be reduced even further. Moreover, this is the first time we have had a president in office who will sign the bill along with majorities in Congress to pass it. DC Mayor Adrian Fenty agreed with Norton, noting that gun-rights supporters would ultimately weaken the city’s gun laws regardless of whether they accomplished it via this legislation and by supporting the bill with the Ensign amendment, DC would finally get a voting seat in Congress. Therefore, Monday morning Norton and Hoyer happily announced that they were expecting the bill to be voted on in the House later in the week. And then … all Hell broke loose. The Brady Campaign, seeing one of the last, failed bastions of gun control on the verge of disappearing, mustered what little influence they still had and called on their remaining supporters to scuttle the bill. 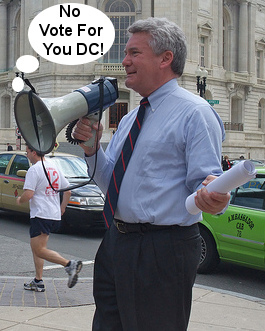 Paul Helmke of the Brady Campaign expressed little sympathy for Norton and the DC residents she represents even if his intervention permanently cost them their chance at a voting seat in Congress. She’d really like to have her vote count, and she’s concerned that after the elections this fall they won’t get another chance to get a vote for the District. And that’s a legitimate concern, but our feeling is that that’s giving up too much to gut the nation’s gun laws. Under pressure from the ragged remnants of the gun control lobby and abandoned by their supposed allies, the very next day (Tuesday, April 20th) the Democratic Leadership backed down and withdrew the bill from consideration, abandoning voting rights for DC for the foreseeable future, perhaps permanently. Exactly one week later, as predicted by both Norton and Fenty, a standalone bill to bring DC’s gun laws in line with the rest of the country was introduced by Senators McCain (R-Ariz.) and Tester (D-Mont.). So where does this leave DC? Regardless of the legislative vehicle, the near future almost certainly holds an easing of DC’s draconian gun laws. But the same cannot be said for DC voting rights. It may literally be decades before there is once again a political environment that will even consider it. When DC voting rights supporters recover from their shock enough to ask “What just happened?”, Norton and Fenty should remind them that they have only Paul Helmke and the gun control movement to thank. One just has to wonder. What is it about DC residents that gun control advocates fear so much? This entry was posted in Brady Campaign, District of Columbia. Bookmark the permalink.